As most of you know, The Beastmaster is an Off Tank. So your primary Job is to make as much dmg as you can. 50STR for the max possible dmg output. 26AGI for increasing the possibility of Crit Attack. 6Vit for some more HP. you can also play abit with the STR and AGI values. like 44STR 35AGI and so on. but i would only recommend that if you have enough Cash for the IShop. This skill got changed with the last patch and is now your ticket for farming. You need 30Beastpoints to make Damage and you recover 10% of your max HP with each hit. Must Have Skill. (MHS) but not that important that you skill it to lvl5. Nice for making Damage and increasing your Beastpoints. MHS but not important that you skill it to lvl5. Only use him when you have 50 or more Beastpoints. Skill which is one of the “you have to like it skillz”. Because of the face that i am only an Offtank/Kiter, only have him on lvl 1 (20Seconds Cooldown). If the Tank dies, and the Boss wants to run into the range dps group, spot the Boss, transform into Tiger and run for your life till the tank is back up. Some people skilled that to 5 because of double Beastpoint gathering. i only need him on 1, its enough for me. 20% up to 100% more Beastpoints with each Skill who aquire them. 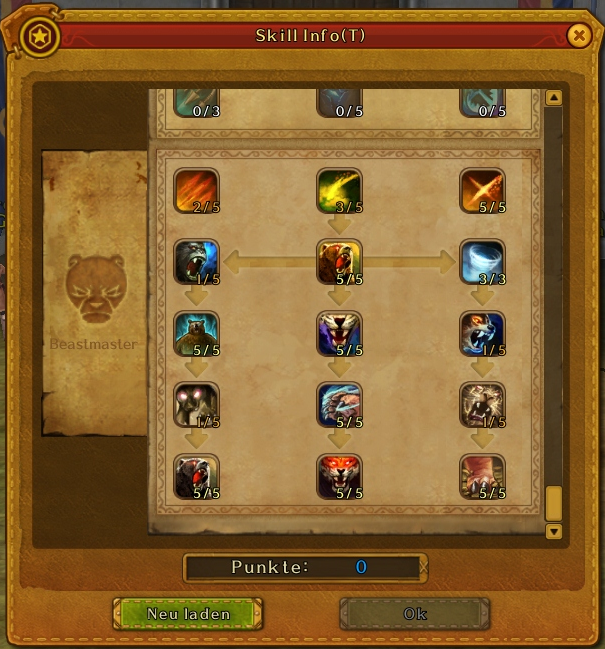 Because of the fact that i am not a tank, i dont need this skill. This Skill is hardly Bugged atm and so i dont wannt to use it. only pre skill. on most bosses you try to make with your baer form as much dmg as you can. When mini adds are spawning, you target them to get them fast down. When big adds are spawning, you go into grizzly and tank them if there is no other knight, warrior or monk who is second tank. When the tank is down, spot the boss, go into tiger and run as hell!!! most of these jobs have to be times and you need experience for not dieing so fast. Try to get fast epic equipment that you reach with buffs arround 8.8k+ with grizzly and 5.7k+ with baer. Here is important that you use the “Dodge + Block” Equipment. The Dps+HP Equipment seems to not working. so its pretty useless for a offtank. The Scratch Raiders for much hp and the Goblin same but with 11AGI for more Crit. Now have fun with your bear. Question What Server Are u playing right now?? ?